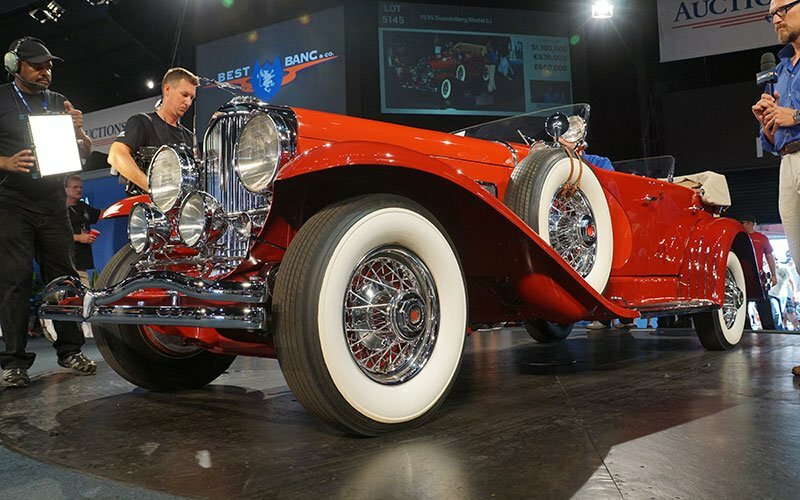 Saturday evening we were there as a 1935 Duesenberg Model SJ sold for $1.15 million in prime time during the Auctions America Auction at Auburn Fall Festival. This was the top sale for Auctions America, a growing auction house and part of the RM Auctions franchise. 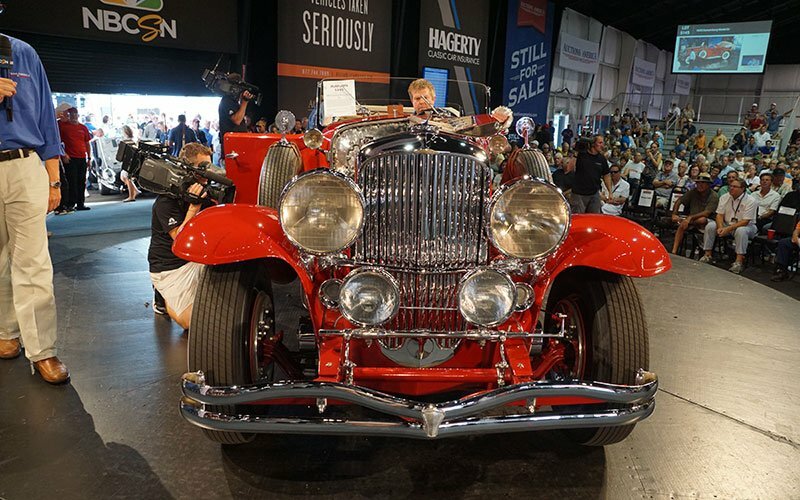 Big money came to bid on this particular Duesenberg. This was the first time Auctions America has sold a Duesenberg for over a million dollars at this event. Photo journalist Bob Boberg, of eClassicAutos.com, caught these exciting photos during the sale. 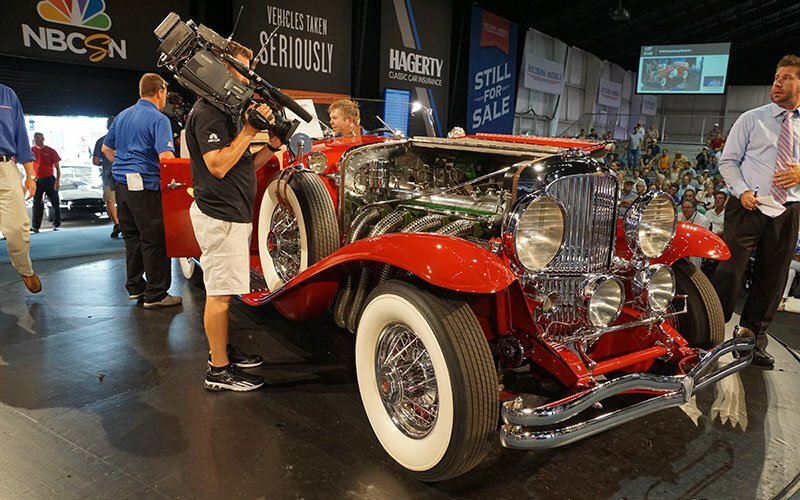 Auctions America puts on a great show each year during the Auburn Cord Duesenberg Club’s Festival weekend here in Auburn, Indiana. The Auctions America Auburn Auction Park is a huge complex located just outside of the city of Auburn. 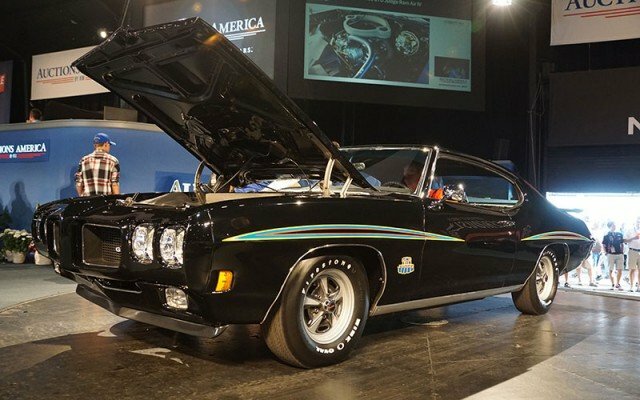 In addition to the auction being held there this weekend, you’ll also find a giant swap meet, car corral and a number of automotive accessory vendors set up there. Photographer Boberg also caught this sale in video. 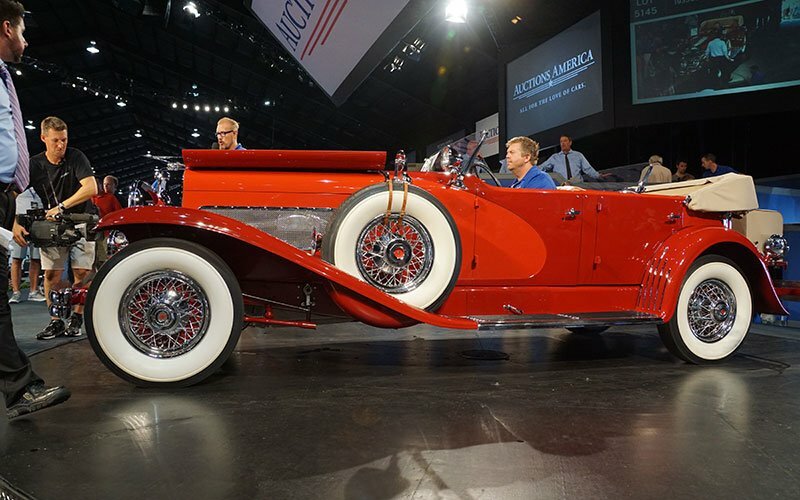 But the Duesenberg was not the only exciting car to sell here last night. 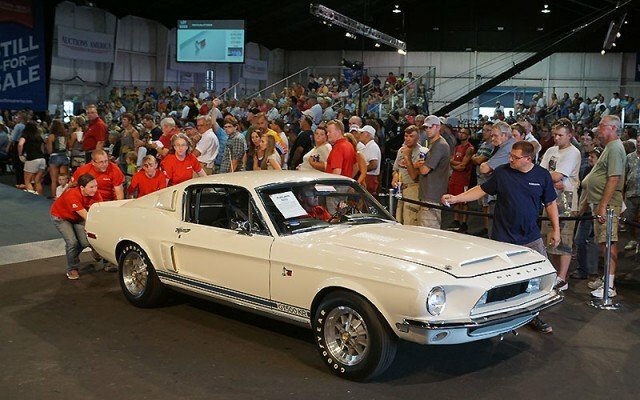 A very desirable 2006 Ford GT Heritage Edition (looks just like the paint and trim on the Ford GT-40s that won the Grand Prix championship) sold for #340,000. And a 2005 Ford GT sold for #300,000. 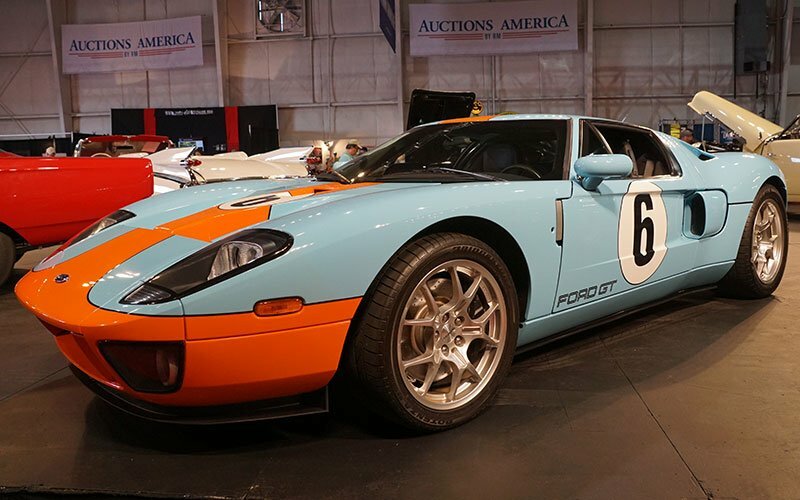 In another top sale of the night a 2006 Ford GT Heritage Edition sells for $340,000. 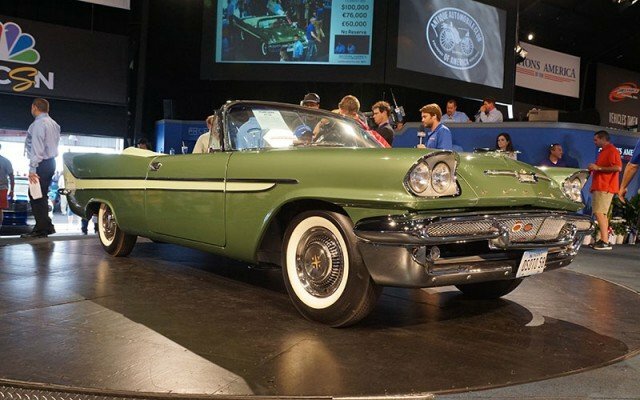 1958 Desoto Firedome Convertible sells for $175,000. 1968 Shelby GT500 KR sells for $126,000. Cars On Line.com is covering the 2014 Auburn Cord Duesenberg Festival here in Auburn, Indiana this weekend. 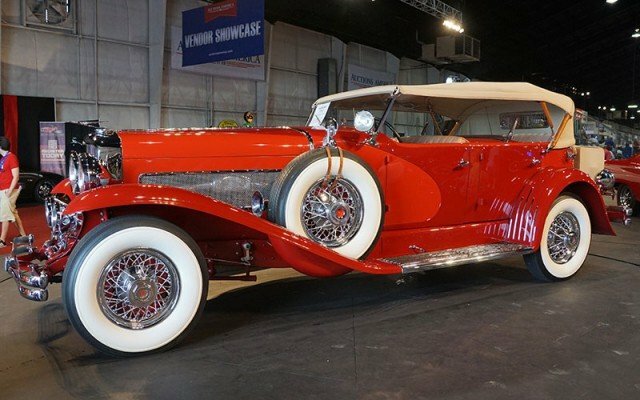 Click here to see tons of photos of vintage motorcars.